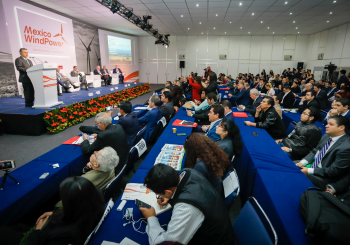 In its eigth edition, Mexico WindPower 2019 consolidates its position as Mexico’s most important Congress and Exhibition event in the wind power sector. It is the only event organized by the Global Wind Energy Council (GWEC) and the Mexican Wind Energy Association (AMDEE), together with Tarsus México. Wednesday 20 and thursday 21 March, 2019. PROGRAM SCHEDULE: From 8:30 a.m. to 6:00 p.m. ENTRANCE ELIGIBILITY: 21 YEARS AND OVER. From 10:00 a.m. to 7:00 p.m.
Free entry to exhibition floor for industry professionals.